0100 8357 A HAPPY PANDA. 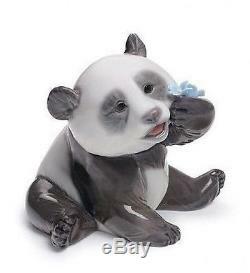 This piece belongs to a series of four cute pandas, each in a different pose with a small porcelain flower in its paw, adding a note of color. Classic glazed porcelain, in the traditional Lladro palette of colours. Each one includes a porcelain flower, in a different colour. This Lladro figurine is brand new and in perfect condition. We reserve the right to make corrections on any item. We will not process any orders where an error has occurred. The item "LLADRO Porcelain A HAPPY PANDA (01008357)" is in sale since Tuesday, January 24, 2017.